CREW Boston members toured Samuels & Associates’ most recent development – Van Ness – located at the 1325 Boylston Street in The Fenway neighborhood. The tour was led by Abe Menzin and gave insight into the development process, including Boston’s first City Target. Members learned about how this building is changing the landscape in The Fenway and ended the evening with a reception overlooking the city. 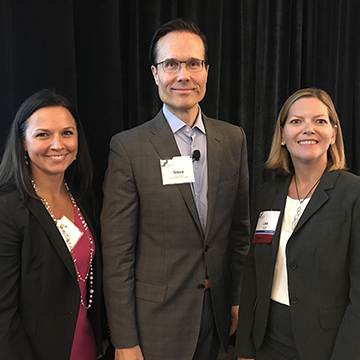 At the October Luncheon Program, CREW Boston member Kristin Blount moderated a panel comprised of Dave McLaughlin of WeWork, Lois Goodell of CBT Architects and Levi Reilly of Skanska to discuss the changing landscape of workplaces. In a move toward creating more efficient workspaces and workplaces where millennials would like to work, many design changes have been made to increase mobility, flexibility, density, sustainability and to create varied places for collaborative working. Spencer Levy, Americas Head of Research for CBRE and a senior member of the company’s global research team, offered a highly interactive presentation on Real Estate Capital Markets at the Sept. 25, 2015, CREW lunch meeting at the Hyatt Regency Boston. Surveying a list of attendees, he singled out individuals working in various categories of the real estate and asked what they thought about the state of the industry – agreeing with most but not all of the responses. At CREW Boston's Annual Meeting & June Luncheon Program in the Wharf Room at the Boston Harbor Hotel, attendees heard from best-selling author and social researcher, Shaunti Feldhahn as she opened the eyes of working women to surprising truths about the perceptions and expectations of men that may be affecting them as women every day in the workplace.